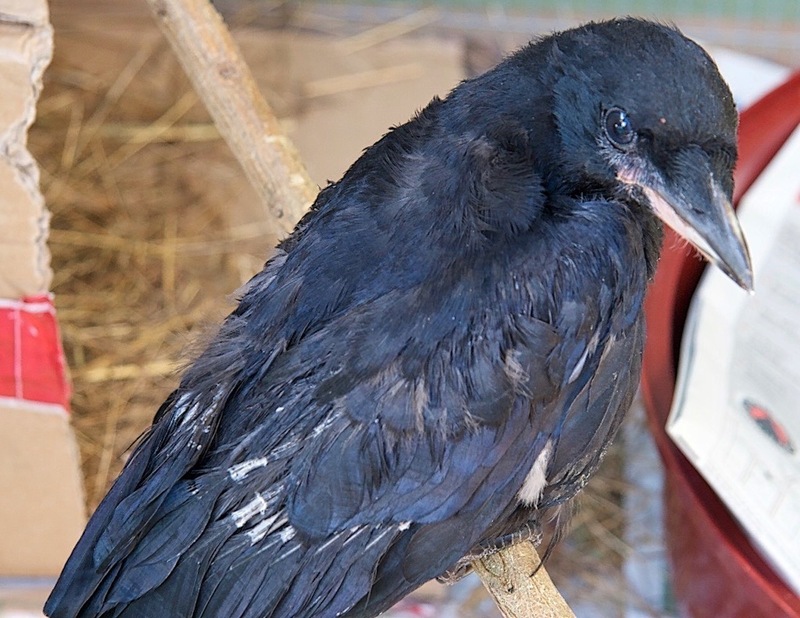 A grounded premature rook or crow with white, brittle or partly broken wing and tail feathers needs expert and longterm care to allow the damaged feathers to be replaced during their annual moult. 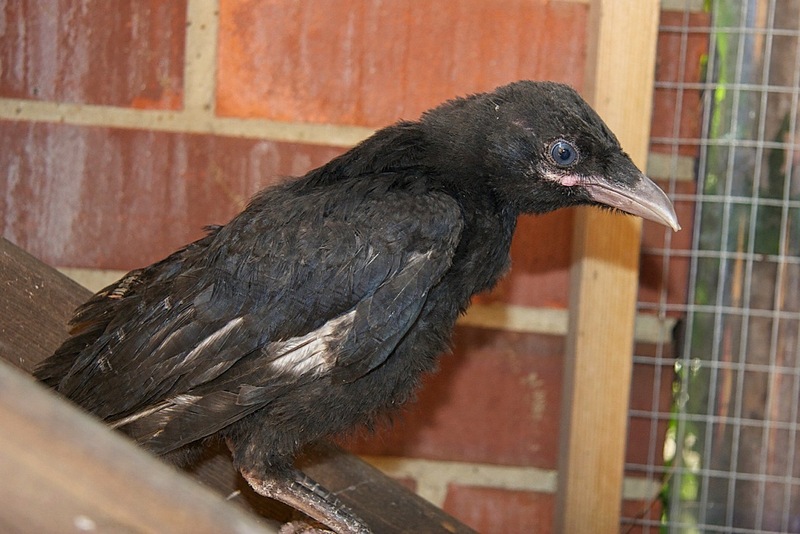 Birds affected should not be released before their complete annual moult, which happens for fledglings born this year in the summer of the following year. Otherwise it will be unlikely that these birds are going to survive their first winter, as the deficient plumage will quickly deteriorate further. This usually means that these birds will eventually become grounded. They will get easily wet and hypothermic, are prone to predation and will soon be unable to sustain themselves. Poor plumage development in corvids, where birds are showing white and brittle feathers with multiple stress bars, can have multiple causes. Genetically caused plumage development problems are occasionally to consider, but are rather rare. These are usually not correctable, neither with a dedicated diet nor by an annual moult. However, there are at least three other more common causes to consider, which are frequently responsible for this problem. 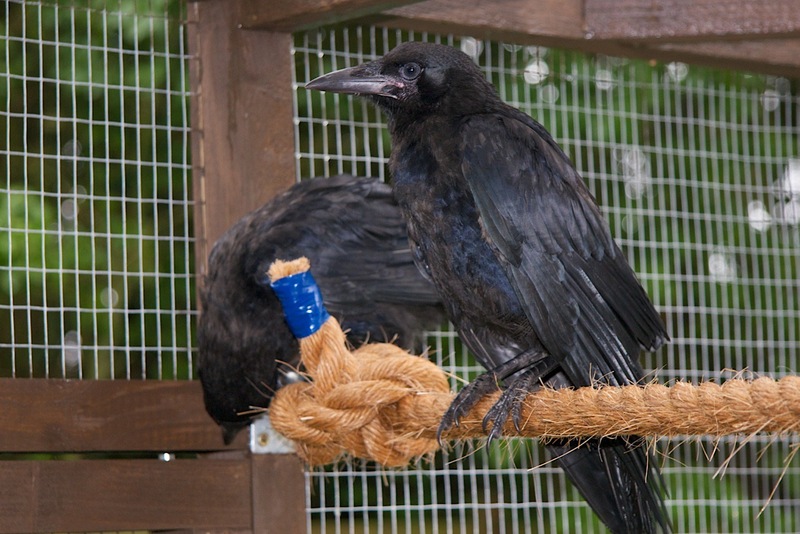 In birds being kept temporally or permanently captive, a problem commonly found is that they are housed under inadequate or suboptimal conditions. It is recommended to provide ample perches, landings or ladders to enable handicapped birds to get to higher perches, which will prevent jumping and subsequent damage to feathers. One should make sure that ladders or perches are away from the aviary mesh, so that birds can not hit the mesh when flapping, which they do regularly when moving up and down. 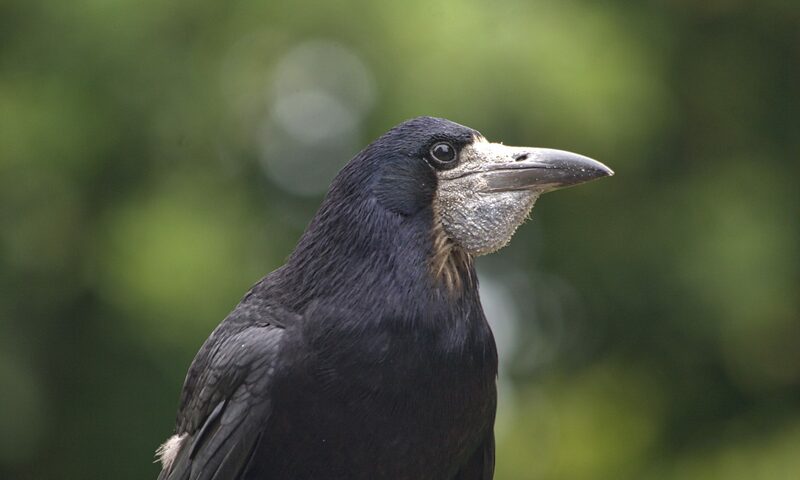 High roosting areas and visual screens are recommended, as birds will always feel safer at the highest point of the aviary, where they can retreat, if they feel like it. This approach should also limit night flight, if night time visitors to the aviary are a problem. Soft bedding underneath roosting and perching areas is crucial in order to prevent serious accidents and repetitive feather damage. The second cause is insufficient preening and superinfection with feather bacteria due to poor hygiene. It is essential to provide a clean bath every day. Natural apple cider vinegar is a very useful supplement, as it aids a healthy digestion and improves feather health. It can be added once or twice a week to drinking and bathing water. Bathing will also stimulate preening utilising the antibacterial, antiparasitic and anti-fungal features of natural apple cider vinegar. Corvids practice anting in order to clean feathers from dust, parasites and bacteria. If a bird does not preen or bath regularly by itself, one can occasionally spray or mist the bird, which quite often induces preening. If the bird is regularly outdoors, one should occasionally check for mites, and in case of an infestation one should obviously treat accordingly. Lack of sunlight is also a serious problem, in particular during the winter month, as supplemented vitamins and minerals need to be metabolised. Sufficient sun light exposure is particularly essential for the vitamin D metabolism. The third cause, and possibly the most common one, is related to a compromised diet during crucial development stages. 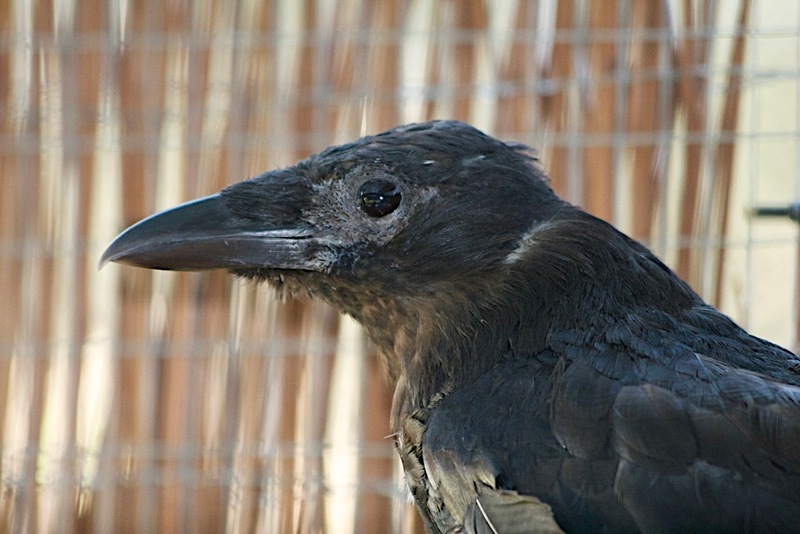 A poor diet or food contamination with agricultural pesticides is a known problem in corvids. Dietary requirements during moulting are naturally higher during than outside the moulting season. Supplements like for example Feather Up (©The Birdcare Company) are recommended, as it is ideal and perfectly designed for moulting birds providing multivitamins, minerals, aminoacids and protein. It is also recommended to supplement calcium (e.g. Calcivet ©The Birdcare Company) and probiotics (e.g. Potent Brew ©The Birdcare Company) in conjunction with this product to achieve optimal results. In birds with extremely poor plumage development it can occur quite frequently that it will take two years or even longer to get these birds to moult into a pristine plumage. However, it is also worth noting, that some birds might never reach this point, possibly due to secondary underlying health issues or possibly because of genetical reasons. These birds should not be released and a suitable permanent home with adequate company needs to be found.